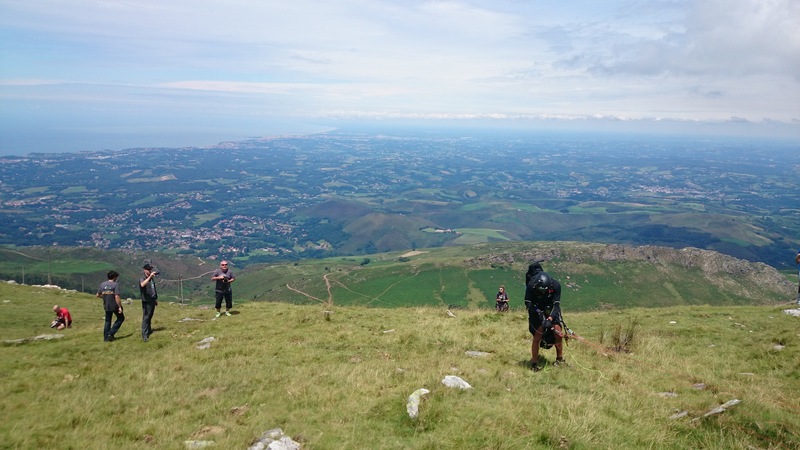 Over six days I completed X-pyr, racing across the Pyrenees with my Ozone LM5 paraglider and Advance lightness harness from the Atlantic to the Mediterranean. 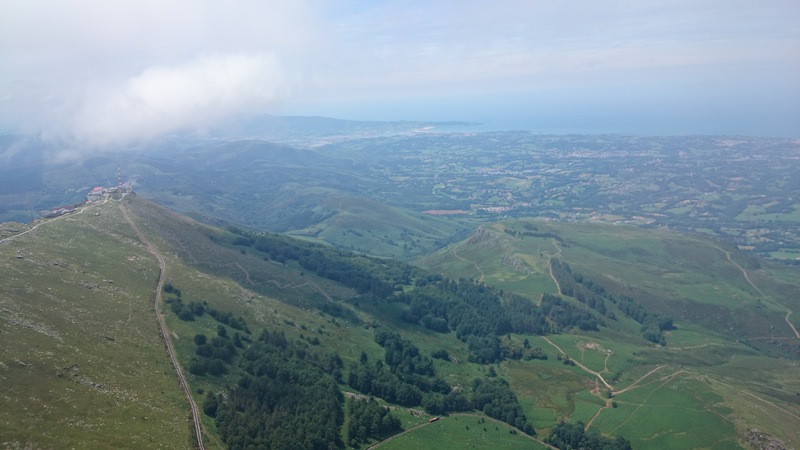 Once we got away from the humid Basque coast we had some great flying days where we covered the majority of the course in the air. Nevertheless an important part of the race was by foot, and I was impressed at the pace necessary to keep up with the leaders. Although the first day knocked me around a bit I thoroughly enjoyed the week, viewing amazing scenery, enjoying interesting flying, and even enjoying the odd walk. My supporter Carl and I got ourselves from Barcelona to the Basque country a little earlier than we needed to, having to find a place to sleep in the pouring rain. The green hills were a marked contrast to the dry desert lands we had passed through earlier that day. The following day I spent 100 Euros on groceries for the race and picked up a gas cooker at Decathlon. Meeting some of the other athletes we noted that Chrigel had the same model car as us, a Citroen Berlingo. It was great little thing with lots of room and compartments, but our main complaint was a timer on the 12V power with the engine off – it later proved very difficult for Carl to keep everything charged. On the day before the race the trackers were presented and we went over the rules. The main bad news to come out of it was that there was a large no fly zone around Mt Perdido national park, and we’d have to walk the last long flat section due to Girona airspace. We’d also been told the week before that the Aneto turnpoint had been moved to Liri (Castejon de Sos), since unfortunately the authorities were less than keen at the prospect of us flying there. 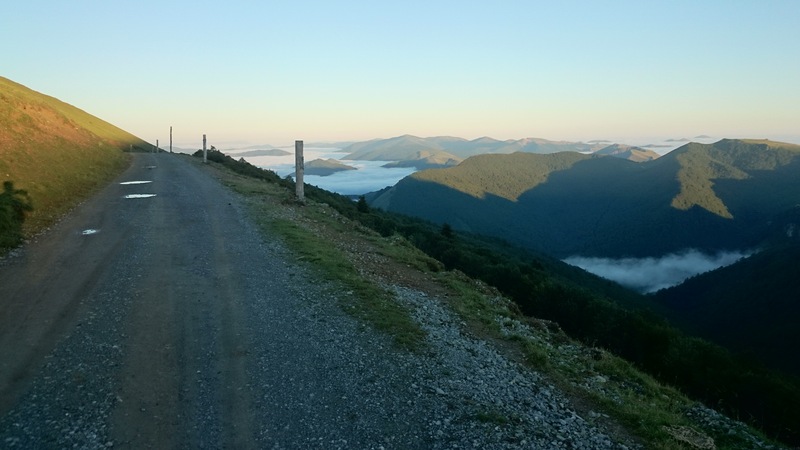 This made the race considerably easier and removed a stumbling block (the highest peak in the Pyrenees) that could have given those lagging a chance to catch the leaders. Finally a few pre-race interviews were conducted, unsure to the last minute whether they’d be done outside or not due to passing showers. I got some laughs when, answering a question, I responded that the long and tiring briefing would be the biggest challenge of the race. 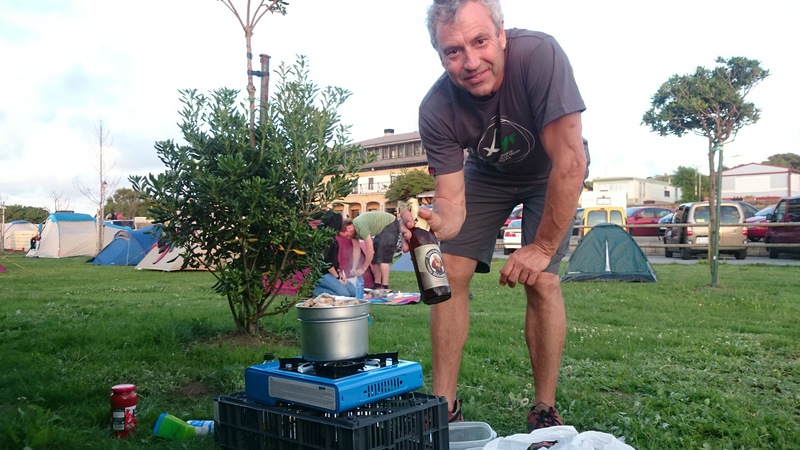 We spent the last night camped with the Polish / Australian team at the lighthouse campground above Hondarribia beach. As I settled down I noticed I had a sore throat – a bad time for a cold. Carl who had finally agreed to go camping moved during the night to try and escape the pig noises coming from the tent adjacent. Up early we had an excess of spare time. I went for a ceremonial swim in the Atlantic. A few of the other competitors were around so we could socialise as we made final arrangements. As the sun got higher we were still lazing around the beach. Inigo (organiser) finally managed to get us onto the starting line and we began racing at 11am. A few athletes had taped plastic bags to their feet to avoid picking up sand, I laughed as white shreds flew around in front of me. I’d decided that I would try and keep up with the main leading pack, not wanting to run but realising that it was tactically important to make the long journey to the first turn point (also the first opportunity to fly, due to airspace) quickly on a good weather day. However I didn’t want to jog slowly, opting to walk fast or run fast, gliding up to catch the other competitors. When the group got split this became more difficult and I later fell into step with Yannick and Jasna. From here we walked quickly but not knowing how far ahead the leaders were I decided to break away. After a “short cut” I found myself beside Yannick again an hour later. Reaching the summit of La Rhune the legs were very sore indeed. You had to be careful to avoid unexpected movements and cramping up – I believe this is why Aaron Durogati later suffered a leg injury. He was one of the first up, and I was about 30-45 minutes off the pace. Getting set up I launched when I was ready and picked up a climb off the spine in the lee of the mountain. Cloud base was a few hundred metres above hill height, no complaints as it had been touching the transmission tower during my walk up. I glided across the first valley and scratched up the hills on the other side. Two competitors had already decked it in the valley, but I was joined in the next half hour or so by half a dozen other competitors scouring the ridge for lift. It seemed we were getting lower and I was getting frustrated with the gentle smooth climbs. My independent decision making had found me a thermal earlier on but rather than look to the others who were now again higher than me, I barrelled on over the back. Since I was quite low I’d lose even more height before connecting with the leeside thermals I was seeking. I didn’t care, it felt damn good having the wing move around above my head, and in the end it paid off and I was back up again and on my way. Since I’d noticed Toma sinking out on the next peak I didn’t linger there too long before barrelling over the back again for my final glide. I’d opted not to follow the convergence line I’d seen earlier heading south, but following Chrigel’s lead I’d still put myself pretty much into the wild during the remainder of the day. 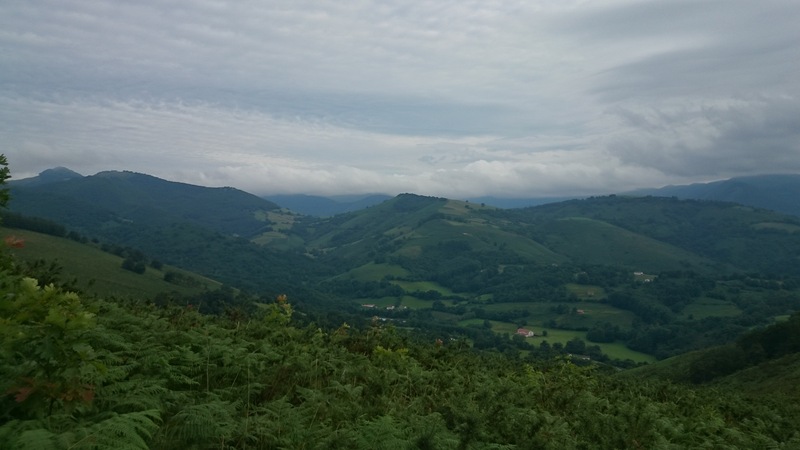 Rather than taking the sensible route over Col d’Ispeguy for a long French valley leading to the turn point, I climbed a bracken hill and took two sideways flights as mid and high level cloud killed the day. The first launch required some cunning to avoid the bracken. I laid my glider out on the dirt track, picking it up there then moving sideways on the road 10-15 metres to a point where I knew it was steep enough to run off the hill. During the evening I walked up a narrow road and took the opportunity to have a wipe down body wash in a small brook by the side of the road. Carefully navigating past the mud puddle to get back to the road I then saw a water fountain only five metres further up the road! We set up camp in the fading light, thinking that yes we should have bought a camp chair, and then I had a poor nights’ sleep, spitting and coughing out of the tent and soothing the throat with lots of water. I was surprised when it started raining at 3am. The previous evening I’d pondered pushing a little further, gliding into the next valley, but now I’d missed that chance. I dozed past the 5:30am curfew and began to realise that it wasn’t going to clear so I set off in the drizzle and mist. Reaching the high point it was not improving so I dropped into the French valley below. I pondered flying in a break between clouds but with sopping wet grass and a down hill breeze it wasn’t worth it. My shoes were drenched with a shortcut and had I had pluggers for the road walk up the valley I may have avoided the blister that formed on the sole of my soggy right foot. Finding that perhaps less than half of the tracks are marked on my Oruxmaps I navigated toward Spain, losing the route once or twice but only for a moment. In the early afternoon I met Carl at Rondesvalles, and he scoped the area out while I climbed up the hill. The weather was finally starting to improve and he saw me off from a launch site. Thankfully it was not his first choice of starting places, as he agreed when he saw the tree filled valley behind us! I flew just a couple of kilometres before landing in the lee (recognisable from the clouds spilling over) of a big spur, with only a short walk to cross it. Unfortunately the other side was white out. Just as I decided to continue though it cleared and I changed my mind again. Finally I flew but only a kilometre or so before I slope landed to avoid the encroaching cloud. 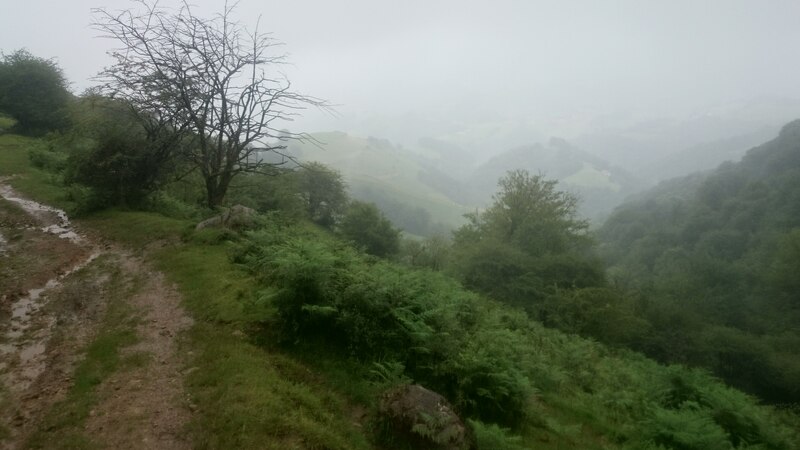 Here I waited engulfed in thick cloud in a state of annoyance for half an hour, finally trudging off down hill – and I saw it was clear immediately! Had it been clear just below me all this time? Too late to worry, I was off, and had a really beautiful flight topping out at about 1000-1100 metres with the vultures. I wish I had photos of that section but the gopro was tucked away and my phone camera was crashing. I made a small crossing into the depths of the green valleys, ridge soared up, and landed on a small col ready to fly again. Another flight took me a little further, I made a little crossing but lost height this time. Walking upwind half a kilometre I ground handled a significant distance before another short flight a little closer to Turn point 2, Orhy. Landing I was under the pump with less than an hour before curfew to pack and race up the col for another flight. I put in the hard yards, climbing at (I’m not sure maybe) 800-1000m / hour, and reached the col, in time, for anticlimax. A valley full of trees saw me walking down 300 metres altitude to the valley were I found a bivvy. Unfortunately Carl was meanwhile driving all over the countryside until late at night looking for me, but I had no phone reception or radio contact to let him know that I was ok. I rose early to start at 5:30am. Wispy clouds formed close to me at 1000m above sea level to form a sea of stratocumulus, making a nice view from the top. Here I had brief phone reception so I rang Carl and arranged for him to meet me on top with food and a fresh battery pack. I was in dire need of this as my battery pack had been fully depleted, no doubt to supply the tracker whilst in a no coverage area. A short flight just west of Orhy indicated that there might be some wind about, and not from a useful direction. This wind was very apparent when climbing up the western ridge of Orhy. It was strong enough to be soarable but gusty and visciously cross so especially with a 100 metre turn point radius on Orhy I decided to be patient. Otherwise the day was blue and looking very promising. I reached the top a little later than I would have liked, but worst of all Carl wasn’t there. With surprisingly hopeless phone reception I had been unable to call him, our radios weren’t working at all, and Carl’s dubious phone battery had completely died so unsure what to do he’d already descended to the car when I reached the top! I couldn’t waste that height though so I decided to make a long glide towards Isaba rather than meet him at the pass. My plan was to resupply there before walking up onto the front range, albeit a little late, but on the highway to make a good flight east. In the air you could soar Orhy and my limited penetration towards Isaba prompted me to change my mind and keep to the main range instead. Landing on the shady side of the spur I walked around, following contours, and gratefully filling up on water. I took off again maybe an hour later, intending to fly less than two kilometres to the adjacent spur. In fact I managed to thermal up, continue along the back range, and then thread my way all the way to Isaba. This was rather unexpected and almost unwanted – with only 30% battery remaining on my phone and no means to recharge I was potentially having to land anyway. I made at least half a dozen phone calls to Carl while he raced back and forth in the valleys, trying to figure out a resupply spot. In the end Durogati sailed over the top of me and eventually I decided that I had to continue, batteries or not, anyway I still had the SPOT. Following Durogati’s lead I got up over the sharp rocky spires rather than on the valley wind facing side, but I was a good half hour behind. I flew quite fast, getting up on the bigger peaks when they offered decent lift but otherwise just flying at trim in the direction of the next turnpoint. When a perfect grassy spur presented itself just below my feet I landed quickly to dress up – still having no gloves and warm clothing, having expected to fly for only two minutes. Then I continued in the same vein as before. 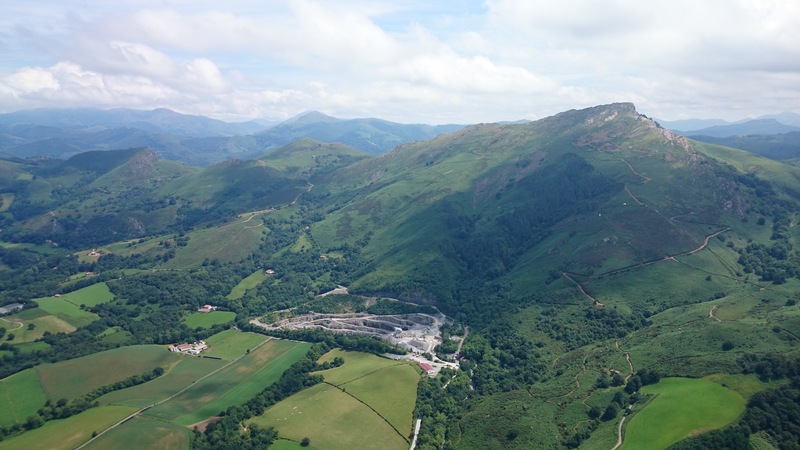 It was easy flying in what I think is the most spectacular part of the Pyrenees. 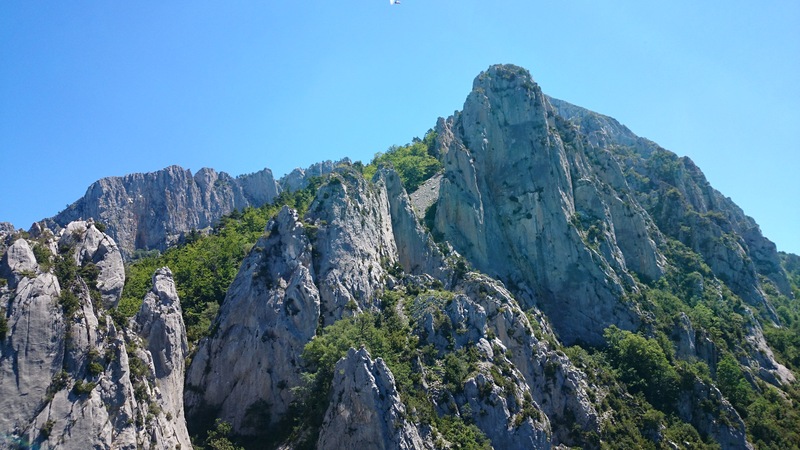 Limestone cliffs, light smooth air, flying fast and weaving my way between high passes with just metres to spare. Before crossing to Turn point 3 Collarada I took a good climb over high rocky peaks that I knew from the reconnaisance trip a few weeks earlier. I didn’t bother climbing at Collarada since there was better lift further along. I thought I’d seen Durogati climbing here in the distance but chances are it was someone else. I took my lead from the sailplane I was occasionally flying with and took the best climbs. Approaching Mt Perdido I knew I had to make a big detour into the lower country to the south to avoid the prohibited area. Up until then I knew the landmarks and didn’t need to check my phone so I was thankfully using only about 3% battery per hour with the screen off. But now I really had no idea how far this area extended and had to check my phone frequently. While it was good flying my line was too far to the west. Even though I saw another paraglider climbing on the mountain to the east of me, I had not joined him, thinking that he would later have to fly onto my mountain to avoid the prohibited area. But that was not the case and I glided further than I needed to. The valley wind was flushing lift away so I was not able to complete the crossing to Peña Montañesa , unfortunately landing in the valley and missing out on some easy late kilometres. Anyway my phone battery was at 5% remaining whilst in the air. After some very astute use of the mobile internet I let Carl know my position, 3% remaining, and he turned up 13 minutes later – quite impressive for such a long flight. Especially considering that Carl was generally bewildered about where he was and which way was which, let alone where I was. But I was even more impressed with the amazing salad he dished up – laced with thin slices of cured meat and balsamic vinegar. It was a quick pit stop as I thought it may be possible to refly but in the end I settled for an early night, camping a few kilometres further up the road. I started walking at 5:32am, having woken twenty minutes before my alarm. Carl had finally had a decent nights sleep at a pension, but he was still up early and off to wait for me at Castejon. Today I had my trusty Salomon boots, having generally used my Salomon shoes for the asphalt sections. 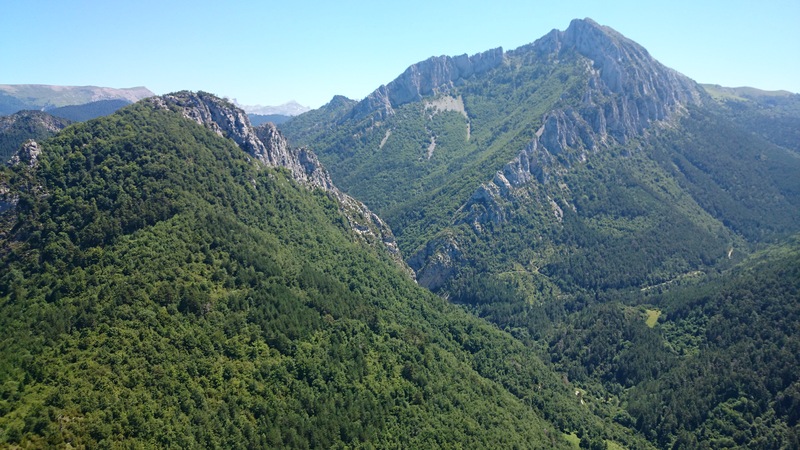 It was an easy walk following a rocky 4wd track, the dry and limestone dominated scenery almost identical to the southern French Alps. Just before leaving I wondered what state I’d been in the previous night – there was no public road for Carl to meet me on the other side of the pass, as planned. We had good phone and radio contact this time though so I let him know there was barely any difference in me carrying everything I needed (versus the essential race gear only). Reaching the pass I was again surprised at my plans of flying off – no thanks. A valley full of trees with a perfectly good track contouring around to the next pass at basically the same level. Here I followed my nose up the next valley, happy to find myself on a minor track. Everything worked out perfect and I climbed high onto the spur (around 2300 metres) to find myself a grassy launch. Meanwhile some cloud was forming on the inversion beneath me, as well as off the high peaks above. To the south and below me was Peña Montañesa with a dozen pilots waiting for the sun to swing around and the inversions to break. I was in a good spot and it already felt like it was on, although Carl suggested I follow the lead of the other pilots (at Castejon and beyond) and wait until it was definitely soarable. This I did but perhaps I didn’t need to wait so long as there were good strong climbs immediately after launching. The inversions were just breaking and the clouds at different levels were starting to mix. I crossed quickly and really enjoyed the climb before crossing to Castejon, some wind and spice in the thermal engaging my senses. I made the long crossing to Turn point 4, arriving high, and continuing to fly fast as big cumulus congestus built up around me. There were storms forecast for the afternoon. Apart from a short walk over a high spur I flew fast to Turn point 5 Orri, although the group ahead was still out of sight. I waited over Orri, making several calls to Carl and trying to ascertain which route the others had taken. Whilst drifting too far downwind out of a thermal I looked at maps on my phone and a frontal threatened while I was in a thermal, zooming in on a word document on my phone, with hands off the brakes. This was the closest I got to having any kind of collapse on the whole Pyrenees crossing. By the time Carl had informed me that the others had taken the northern Andorra route as flown the previous day by Chrigel, I had pretty much decided on the southern route. The issue was the line of storms ahead, blocking the way to Puigmal. 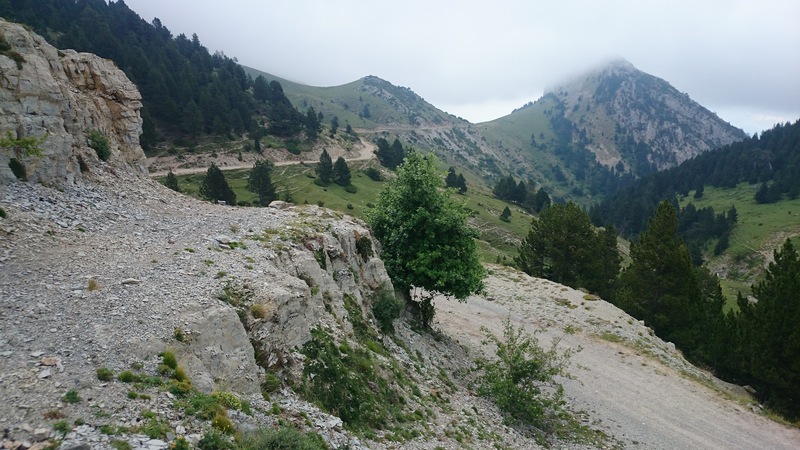 By taking the southern route I would not have to cross the wide Puigcerda valley by those large cells, and with some luck I might even be able to thread my way around them. Pointing my glider in the direction I wanted to go, and taking climbs when I came across them, I began to approach Organya from the “wrong” side. This was similar to the equally interesting flight I’d done from Orri some weeks earlier. There were big clouds as stepping stones but as I searched underneath them for the thermals I found they were dissapating. I crossed over the Tost plateau, fairly low but there were plenty of landings scattered around. I was intending to connect with the long Cadi ridge, which we’d been calling Carl’s ridge since he spotted it on the map those weeks ago. By the time I reached the pass at the western end of Carl’s ridge I was not above road height. Thankfully I was able to connect with convergence and take a good climb up as high as I wanted to. Along the courseline a dense mass of cloud was touching the top of Carl’s ridge. Going as far as was sensible I landed further along as low cloud originating from the storms to the east blocked off the way. I had some wonderful evening walking over a pass and sidling around to another pass, where the cloud suddenly began showing signs of clearing. With a few light showers passing through I took some time to make the decision to fly. Since there were limited landings ahead I continued sidling east and upward to ensure I’d be able to glide as far as possible. This was the perfect thing to do and I found a steep launch on forgiving low undergrowth. I rang Carl and he mentioned some patches of sun shining into the valley. I told him I was already too late but would be attempting to glide down shortly. Just after talking to him the katabatic arrived, but I waited a couple of minutes for a slight lull and managed to get off first time, albeit with a cravat that took some tugging to clear. A sublime glide followed, passing through some very light rain but keeping fairly dry and passing 9.5km of dramatic cliffs and terrain in a very civilised fashion. Carl called me and literally guided me into landing, I chose a small field one hundred metres from the camp ground. My route choice was fortuitiuos for the hitch hiker Carl had picked up in Castejon who happened to be going to the exact village. Baga is really not a common destination. The young chap was very helpful for Carl, operating the laptop and significantly reducing the most significant and dangerous risk of the race – driving with fatigue and distractions. We shared a bite to eat and it was another late night but I decided with where I was that I could afford a little sleep in the next morning. Departing at around 7am I enjoyed the long walk up hill in the direction of Turn point 6 Puigmal. My stomach felt a little funny so I just ate some olives. Reaching a sunny hillside I ate some more while waiting for it to come on – it seemed like a slow morning. Finally I launched and slowly lost 500 metres of height, following bubbles. A bit wasteful but tactical in the end as a local had meanwhile told Carl that I was not to fly there, so it was best to stay out of the limelight. I quickly packed and walked up a track and followed the contours around to the east. Flying again an hour later it was still very fickle. Circling in anything I let myself drift over the open green fields in the direction of the turnpoint. Everything was rather flat and probing for convergence over the col I landed. The clouds had a strong NW drift (Stani had reported 25km/h on top of Puigmal that morning) but down here it was 15 knots in the opposite direction. Having reports of nil wind I wasn’t overly concerned and landed tail wind, my left hand connecting with fresh cow dung. Wiping it off in disgust I wasted no time and mostly ground handled a kilometre or so toward the turn point, where finally I could fly, eventually crossing to SE facing spurs and getting climbs, much to my relief. Now at 2:30pm the clouds were hiding the summit of Puigmal but the way was still open to the spur where I could tag the 1500 metre radius turn point. 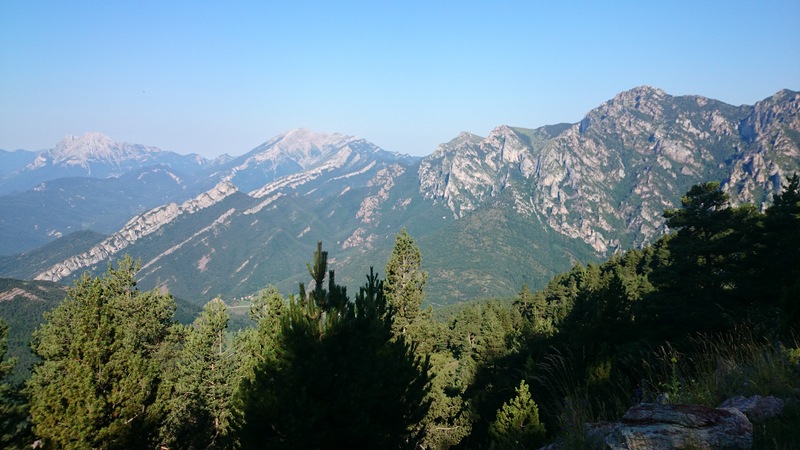 I continued on the course, noting that while earlier aspects of Puigmal were quite tame there was some impressive mountain scenery on the eastern side. Not much further and I nearly fell victim to the valley wind, regrouping low on a windward spur and starting a slow recovery back up the slope. Crossing deeper into the mountains I opted to follow the French side for this latter part of the race. I was quite isolated already so in terms of my place in the race it really didn’t matter if I took the scenic route. 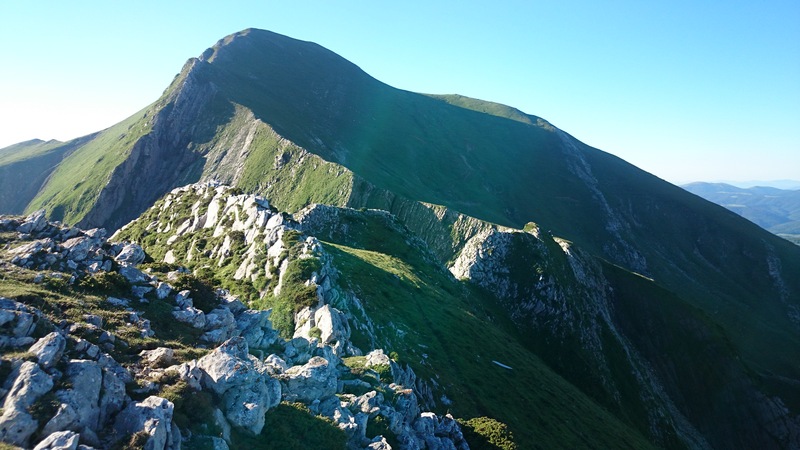 I landed on the col and relaunched on the other side and enjoyed a really wild passage behind gorges and above forests in the late evening sun. I took my final climb as high as I could and glided with concentration toward the Spanish border. I smile spread across my face as I saw the ocean through the Meditteranean haze on either side of the Pyrenees in front of me. As I neared the range I noticed the wind, which I anticipated coming from the NW or more likely the NE, was from the SW. It was really strong but with the bar I managed to put it down in a clearing at 800 metres altitude just a few kilometres from the border, on the French side. I packed quickly and tried to find myself a launch into Spain. With no phone reception to download google maps satellite imagery and very limited help from Oruxmaps I was a little lost, in the Catalonian scrub. In the end my route choice was less than optimal, but I doubled back for a very poor launch in the fading evening light. I had to get the wing up behind the edge of the road but the problem was the big pine trees blocking launch. My long right wing snagged and turned me 15 degrees before breaking free with a souvenir pine cone lodged inside my wing. Judging the few emergency landing options on the way as unnecessary, I used nearly all of my height to skip winding 4wd tracks and land on the sealed road. 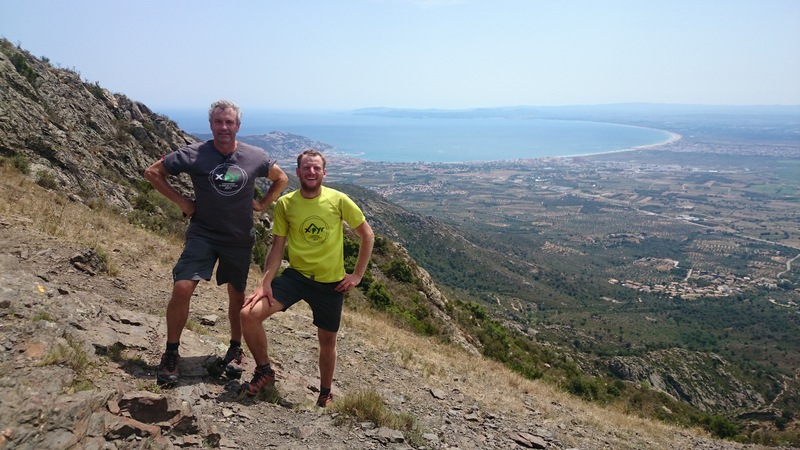 From there a walk to Macarena and another salad worth crossing the Pyrenees for from Carl. Setting my alarm for 5:25am I was walking six minutes later. My sole blister caused some discomfort for the first five or ten minutes but didn’t enter my mind for the 42km road marathon following. It was warm, even starting at dawn I didn’t wear a tshirt. Thankfully there were no other competitors nearby so there was no need to rush – I kept to a consistent fast walk. The route identified by Google Maps for walking served me well, although there were a few minor navigational issues on the way. My mid morning wash felt great. 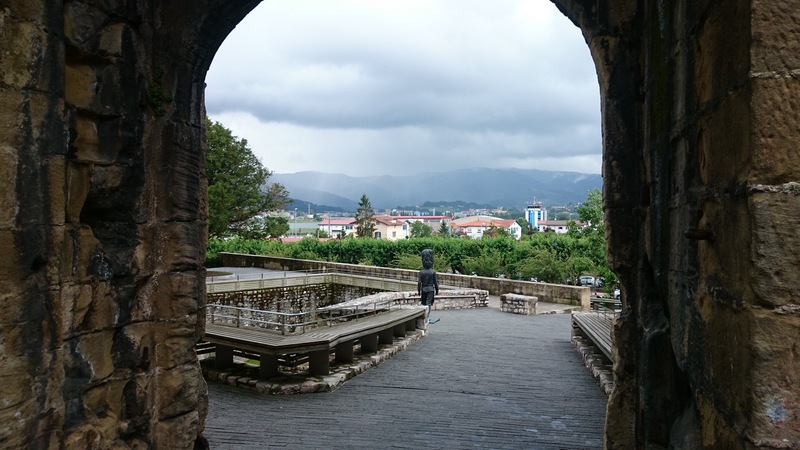 It was nice enough Spanish countryside with some beautiful old towns to pass through but generally it was the boring day I expected. The earphones came in handy for the latter stages. 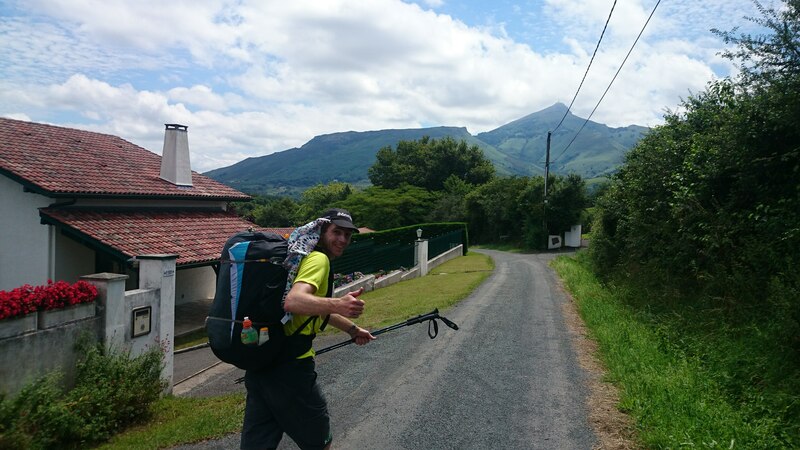 Generally I felt great, much better than on the first day with that rushing up to the La Rhune turn point. 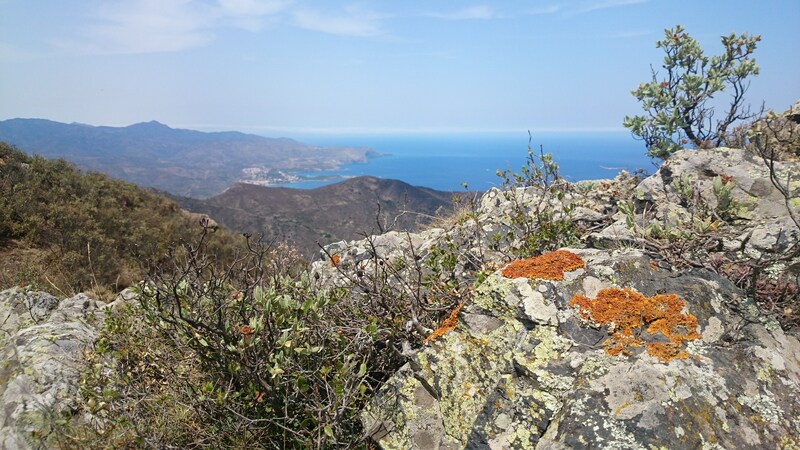 I climbed the final hill to Pere de la Rodes fast and effortlessly. It was a shame that on arrival the winds had become too strong to fly down to the beach – even if I had managed to launch there were a disconcerting number of white caps, even in the lee of the headland. But I guess it’s always good to leave something for next time. 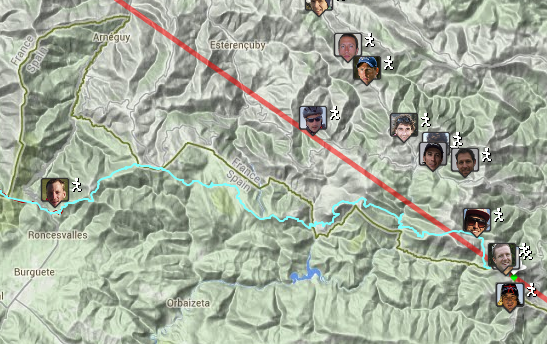 The live tracking is essential both for followers back at home, and for competitors. It was a shame that tracking app for phones did not work and the map tracking was basically unusable on a phone. Having a race, as opposed to solo vol biv, means you can compare notes and get a new appreciation of what is possible. 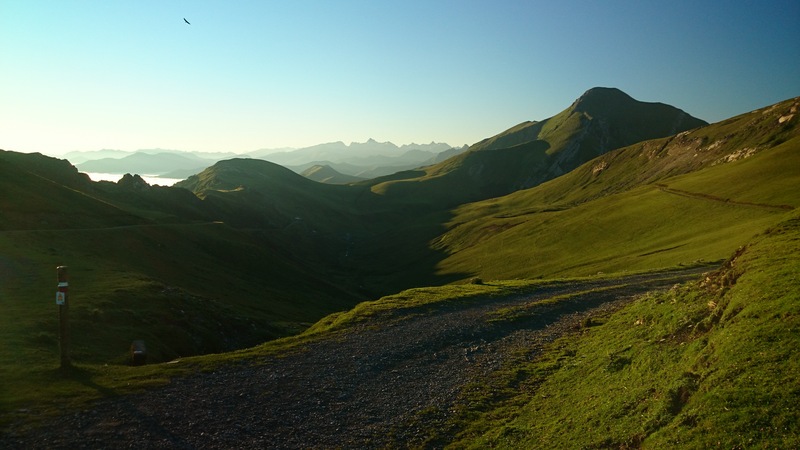 The tactical aspect of choosing routes and where and when to fly is perhaps what gives the xalps style of race so much interest as compared to a standard paragliding competition. It would be great if the technology allowed competitors to get as much out of this as those at home on a large computer screen. 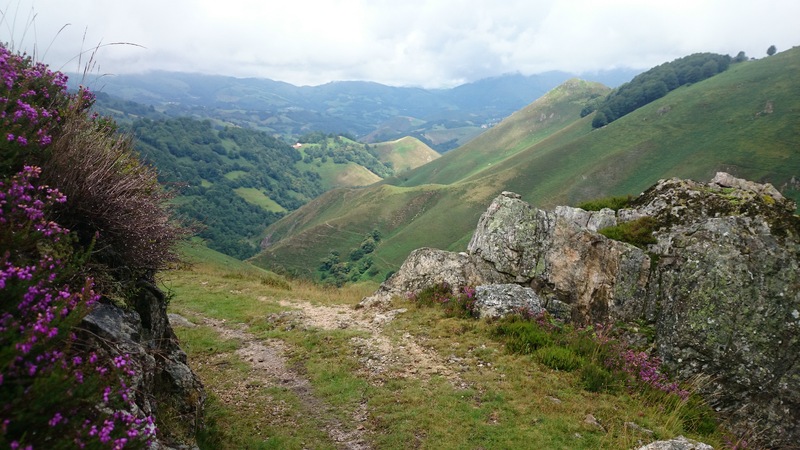 To this end the phone coverage in many areas of the Pyrenees make this a challenge, although being able to quickly ascertain the current status of the race a few times a day would be a really great. The first leg to La Rhune, over 15km in a straight line but much further by foot, is a tough start in any weather. But when you leave the beach in the heat of the day at 11am, knowing that every minute earlier you launch could save a lot of walking, it really is quite cruel. Sure, it’s tactical to decide whether you gamble on extra crucial miles flown through the Basque country, or saving your legs for the race. 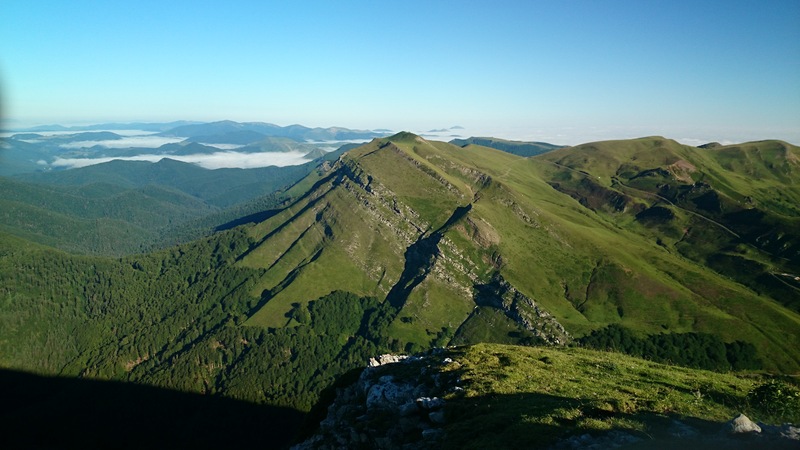 But the stakes are really high since the easy flying miles come later in the higher and drier Pyrenees, and I think that collectively you could get more out of the athletes if you allowed them to start earlier. Even 9am retains a great sense of urgency to get to the launch on time. I did a reasonable amount of organisation for the race but I kept the minimalist approach for food and equipment. In hindsight I could have kept the solar panel charger with me as the logistics of meeting up can prove difficult. Carl had always said that his weakness was operating and being organised with all the technology and this was a challenge for us. Andrew back in Australia presented us with crucial information about our positioning that was difficult to obtain by us (or Carl) on the road. If there were any other deficiencies in Carl’s support it was far overshadowed by the enthusiasm and amazing meals he provided! I also kept it simple with weather forecasts, and in any case I don’t know how reliable the forecasts are in this area. Our day two could have been slightly more optimised in hindsight but otherwise you just fly as far as you can with what you have. I can see that in a longer race though many route decisions will hinge on the weather forecast. We were lucky to have great flying conditions for our X-pyr race. Although our second day was mostly washed out we still flew, and the first day was far better than any time leading up to the race. Records were broken during the middle of the race and in short, we flew every day. The exception being the end of the race where the weather closed in again. After recovering from my cold and the exertions of the first day I felt really good and the course really seemed to be too short. 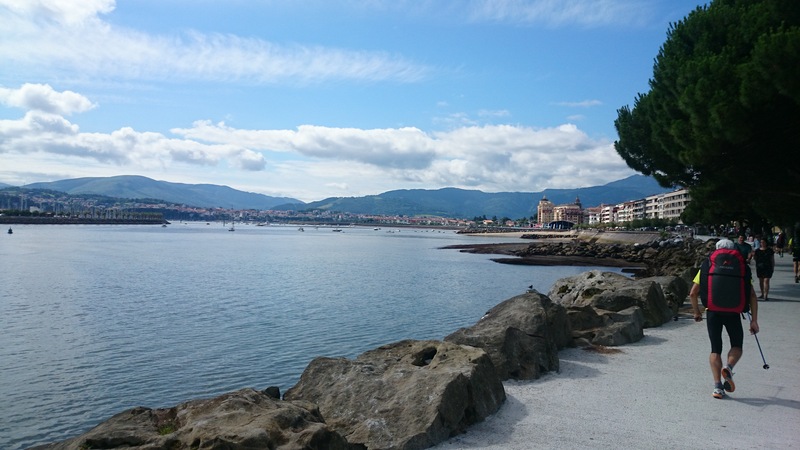 No sooner had we finished the briefings at Hondarribia than we were milling around the El Port de la Selva beach. I had a great time mixing it up with some of the personalities of our strange sport and finding my way through the amazing scenery, forming memories which are still fresh in my mind. 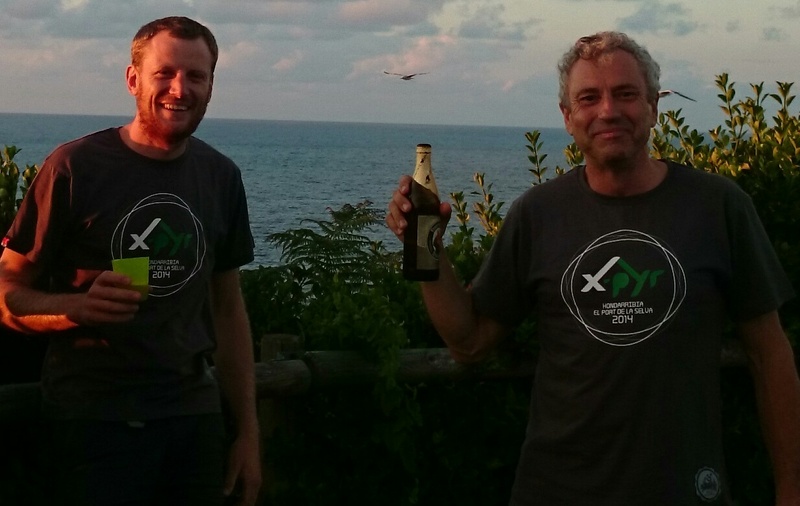 I must thank the X-pyr organisers, all the friends who followed and offered support, and particularly Carl for his inexhaustible enthusiasm over the action packed week. I should also say that the beer and swim at the end was a great way to finish. 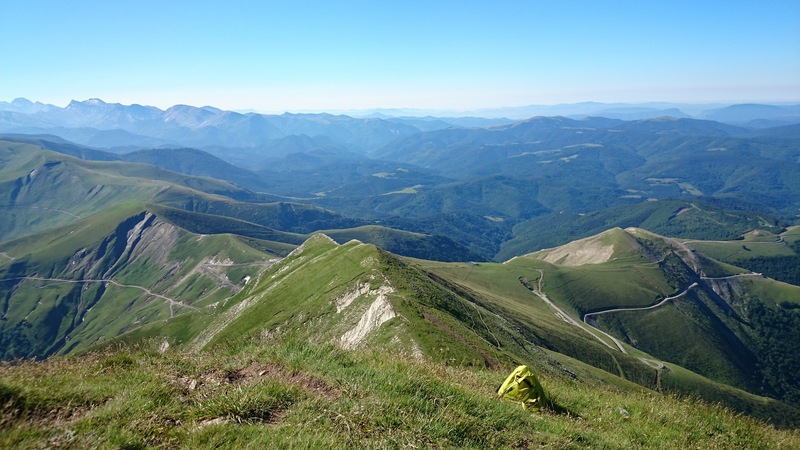 This entry was posted in Uncategorized and tagged adventure, paragliding, x-pyr. Bookmark the permalink.